Previously, we kickstarted the week with Martian Comics #3, a special anthology meant to evoke visions of early Vertigo comics like Sandman. This time, we’re covering Martian Comics #5, which readers can enjoy without having experienced the previous issues of Martian Comics. Ever wonder what Martian’s science-fiction is like? Wonder no longer thanks to Martian Comics #5! I spoke again with the writer of the series, Dr. Julian Darius, a comics scholar and founder of Sequart Organization. Martian Comics #5 is a 23 page full color issue titled “The Canals of Earth.” Despite taking place in the same universe as previous Martian Comics stories, newcomers to the series will be able to follow the self-contained story. 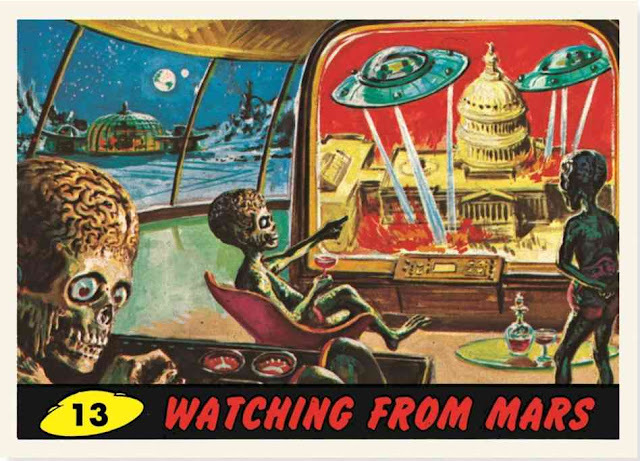 Martian Comics #5 looks at how Martians view us earthlings. The story starts with Martian prehistory and extends to their space age. At first, Martians look at Earth as a goddess. Then, Martians begin creating myths about Earth related to writing. They also create their own Martian science-fiction, picturing aliens in their own image. The space age shows probes sent from Mars to get images of Earth until, finally, there is the first manned Martian mission to Earth. 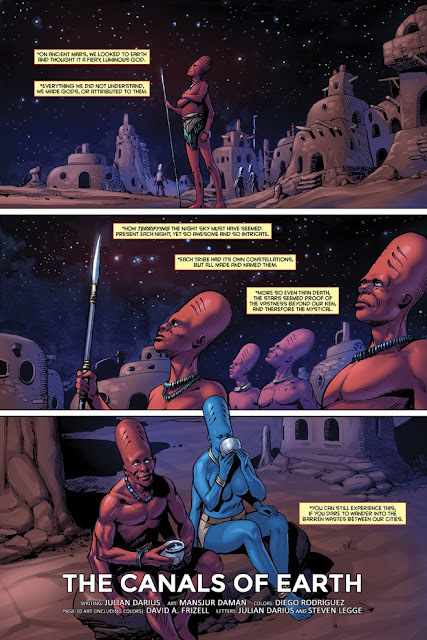 Martian Comics #5 is written by Dr. Julian Darius, illustrated by Mansjur Daman and colored by Diego Rodriguez (Ballistic). The cover was created by David A. Frizell, who also did the cover for Martian Comics #3. 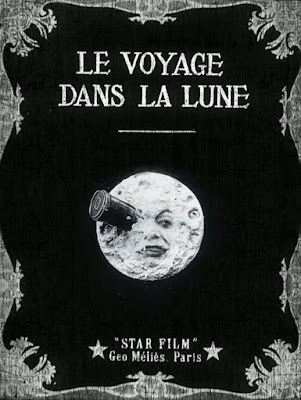 It is an homage to A Trip to the Moon, a classic silent film from 1902. The issue is still in the process of being colored and lettered. It is planned to be released in July but donors may be able to get the book sooner. The project will be successfully funded if $2,500 are raised by April 27, 2016 at 9:00 PM EDT. You can pledge money to their Kickstarter here. 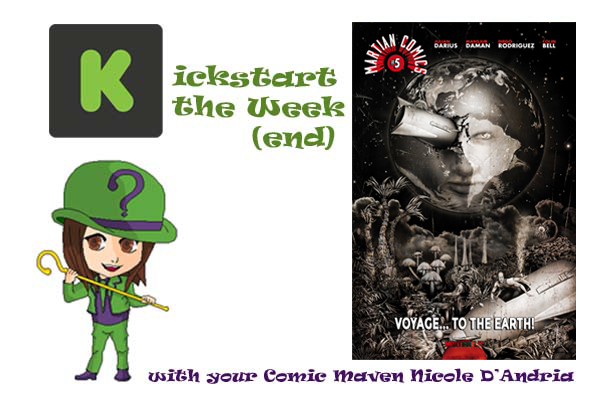 Rewards begin at $3 with a digital copy of Martian Comics #5. 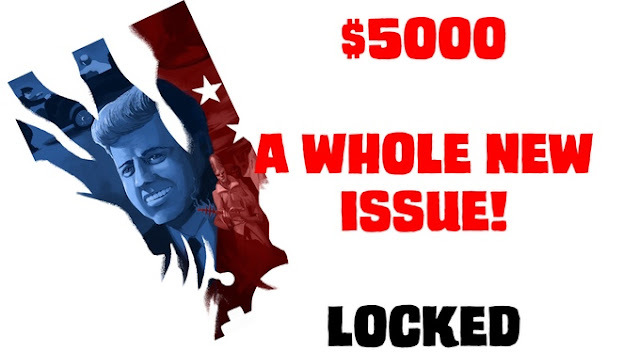 At $20, backers get the comic book in print, which is produced exclusively for this Kickstarter. Each copy will be signed and also numbered by writer Julian Darius. Also included in this $20 deal is the digital version of the newest issue and all the past issues of Martian Comics (valued alone at $18). Other rewards include two exclusive postcard prints, digital subscriptions, Julian Darius’s novels and documentary films from Sequart produced by Darius. Me: What inspired you to create a story about Martian science-fiction? Julian Darius: "The Canals of Earth" started almost as a thought experiment. I was thinking about how Mars (which has a technologically sophisticated civilization, in this series) related to Earth over the years. I was thinking about how ancient humans looked to the skies and thought of the planets and the stars as divinities, and how every human civilization apparently made constellations, even though they named them differently. And I thought, ancient Mars would have done the same thing to our planet! And from there, I was off to the races. 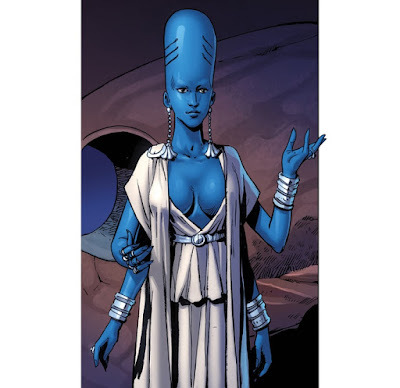 I started thinking about this Martian goddess Earth, who'd have four arms. I was thinking about how we saw canals on Mars, and our early, pulpy sci-fi about Mars is implicitly appropriated by the series. So I started thinking of how Mars would look at Earth, not understand and debate what they were seeing, and write their own stories about Earth. And of course, Earth would have four-armed inhabitants who looked remarkably like Martians, the same way we imagined aliens basically looking like ourselves. Once I started, it was so much fun writing Martian science-fiction. There's a reference to the planetary romance genre, which is reflected in Martian sci-fi as male Martians journeying to Earth and romancing human women (who of course look like Martians). There's discussion of different imagined human societies, as Mars imagined them -- underground civilizations, aggressive civilizations, primitive civilizations. There's a scene like Star Trek, in which Martians are watching Martian actors in body paint, playing aliens. And I hope that all of this lets us see how we're always projecting our own anxieties in our depictions of the Other. And beyond this deeper message, there's just such a sense of joy, of wonder, to seeing Martian science-fiction! Me: Why do you think it’s important to talk about the Other? Julian Darius: That's a key question. First, I think it often makes for good stories. Especially sci-fi ones. It's fine to make stories about one spaceship shooting at another, or stories about alien warlords fighting. But a lot of sci-fi is about other civilizations and different perspectives. Certainly, a lot of the sci-fi I like is about this. But even beyond sci-fi, there's a certain capacity to identify with other points of view that characterizes good fiction. It's why bad guys who don't think they're bad guys make for better villains. It's also a huge part of what we love Shakespeare for: even when he was writing a Jewish stock character, like Shylock, he puts himself in that character's perspective enough to give Shylock the famous speech about his shared humanity. So this is a good narrative choice. More importantly, it's important to me from a wider, social perspective. Going back to Shylock, people at the time were there to laugh at this stereotype, but we know from first-hand accounts that doing so left a bitter taste in the audience's mouth. For me, empathy and compassion is one of the most important things, in life and in politics. And looking at the world today, it's very needed. One of the keys to growing as a person and treating people well is the ability to see from another person's perspective. And I think that's one of the core things literature does: it lets us see another perspective. We enjoy this because we're curious, so experiencing the life of a 19th-century Russian peasant, for example, takes us on a journey we enjoy. But this also expands who we are as people. We're all limited in our perspective. The same experiences that give us our identities and our areas of expertise also give us bias and limit us. To counteract that, we have to always be willing to check ourselves and project ourselves into other perspectives and identities, however imperfectly. Martian Comics isn't a very political series. At least, it doesn't wear any politics on its sleeve. But when I look at our politics, I see a desperate need for this empathy and ability to empathize. Scapegoating Latin American immigrants (including children!) and Muslims is such an ugly business, and it lets us project our fears onto an Other, rather than reaching out. I think the same thing about anti-LGBT legislation and anti-female legislation, both of which are still sadly rampant. And we see it in the "thugification" of unarmed blacks, and in how we're encouraged to imagine ourselves as a policeman or a soldier, even when they killed someone, rather than as the victims. Otherizing people makes those people less than human. We imagine whole classes of people to be unlike us to the point of being inhuman. And of course there are differences, including practices we might want or need to condemn, but we should always be trying to understand, to project ourselves into someone else's experiences before condemning. If we're able to put ourselves in another perspective, it shouldn't take much to see that for every scary example we're preventing, we're harming dozens, hundreds, or thousands of people who live, love, and experience every single emotion any human is capable of. In fact, I'd argue that empathy is part of condemning in any moral way. Even if you think in terms of war, you don't have to hate your enemy as inhuman, even if you feel an ethical obligation to kill that enemy. And if you go back to The Illiad, literature has been doing this from the beginning. That's why, although Hector was the enemy from the Greek point of view, we see the Trojan point of view too, and desecrating his corpse is sacrilegious. And we're not going to make any progress against the challenges we face if we think they're the consequences of inhuman hordes or leaches or rats or whatever. Even if you look at something like terrorism, thinking of terrorists as the Other is likely to spur you to bomb them, and their families, and take draconian actions that spur more terrorists. I don't say a "hard stance," because I think this is only the appearance of being tough. I think having empathy and taking a strategically (not merely tactically) sound approach is actually a lot harder. And it's incumbent upon us to do so. This is part of why totalitarian regimes have often censored literature, and it's part of why certain sectors of American society known for their scapegoating tend to ridicule art. Art and literature -- not exclusively, by any means, but in general -- help us to empathize. It's one thing to read about the Holocaust, and it's another to care about a character and vicariously experience that character going through the Holocaust. And I certainly see a lot of hardened hearts in our politics. I also see it in our interpersonal relationships, a kind of commodification of one another and even ourselves. We're being taught to evaluate ourselves by how much money we make, or how attractive we are physically, or only by how good we are at some job we didn't create -- rather than, say, how much we've grown as people, or how good we are as people, or whether we'll go to our death thinking we led a good life we can justify to God or to ourselves. I don't mean to say that literature is the Answer to all of this, or that art is always loving or should be moral, in any conventional or limited way. But even if you think of the most escapist narrative, it's escapist because it allows us to escape ourselves, to go into this other world and this other character's experience. And while I'm under no illusion that someone's going to read Martian Comics and decide to love their spouse or change their politics, I do hope on some level that it nudges people -- including myself -- towards compassion, towards empathy, and towards identify with others, rather than seeing them as Others to be scapegoated or legislated against. I think, also, that I'm personally haunted by the gulf between people. By the simple fact that we don't really know what other people are thinking or feeling, or what they've experienced, and that they don't know the same about me. Partly, it's because I've been depressed and hurt myself, but I'm amazed at how many people are hurting and don't say anything, or have never had much love from their family or their romantic partners. To me, the only answer is a kind of radical honesty and encouraging people to feel safe sharing -- and to have the courage to share yourself, even (or especially) when it's scary. Life's too short not to. But it's something I still struggle with and am always trying to do better with. I think we are healed by bridging this gap between ourselves and others, and by listening and identifying with others, rather than merely seeking petty short-term advantage over them. So it's personal for me. Me: If you had to pick your favorite portrayal of Martian from any form of media (film, television, novels, comic books), which portrayal would you pick and why? Julian Darius: I don't think it has any bearing on my own Martians, but I love Mars Attacks. I love the old trading cards -- they're so imaginative and perverse. And I love the Tim Burton movie, which just seems to throw out structure and go wild. It's a totally different mode than Martian Comics, but I love it. I'm also a big fan, a bit more generally, of earlier sci-fi that could imagine the entire solar system populated. It just seems so wonderful. And it was totally responsible. After all, why should only Earth have life? It was actually more responsible to imagine we weren't the only ones in our solar system. I still think there's extraterrestrial life, and there's almost certainly single-cellular life elsewhere in our solar system, but the reality that we're going to have to travel to other solar systems to meet intelligent life, in whatever form it evolved there, is such a lonely thought. Space is so empty. But it wasn't always so much so. Me: Who decided the cover should be an homage of A Trip to the Moon and what is the significance of this film in regards to Martian Comics #5? Julian Darius: That was my idea. I usually come up with the idea for the cover, although I give artists a lot of freedom to go their own direction. For Martian Comics #5, I didn't know what the cover was going to be for a long time. These stories have such a long lead time, and I like that, because it lets me ruminate. Eventually, the reference to a Martian version of Trip to the Moon solidified and worked in my head. David A. Frizell knocked it out of the park! Originally, there actually wasn't a reference to Trip to the Moon in the story. It was just a cover idea that captured the spirit of the comic in an iconic, visual way. The story is sort of doing much the same thing -- we're looking at sci-fi from an alien perspective, and finding our own predilections reflected back at us in this odd but fascinating way. However, I liked the idea of the cover so much that I decided to incorporate it into the story! And there was a place, in the discussion of Martian sci-fi, where it fit perfectly. 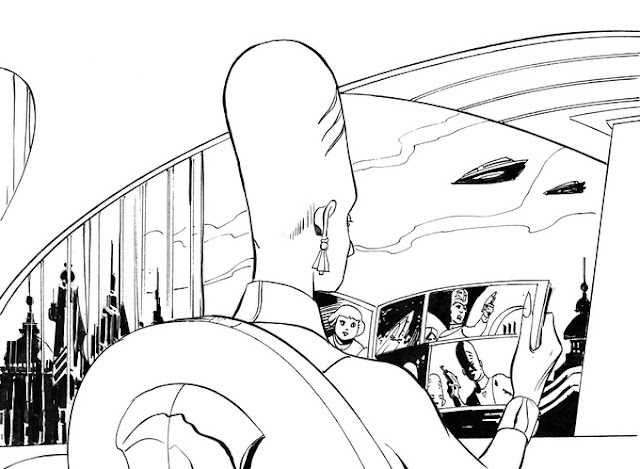 It's just before a half-page panel in which we see a Martian comic book! Me: If Martians and earthlings met, how do you think the meeting would go? Julian Darius: My Martians have met humans lots of times! And it's gone very differently, depending on the circumstances. 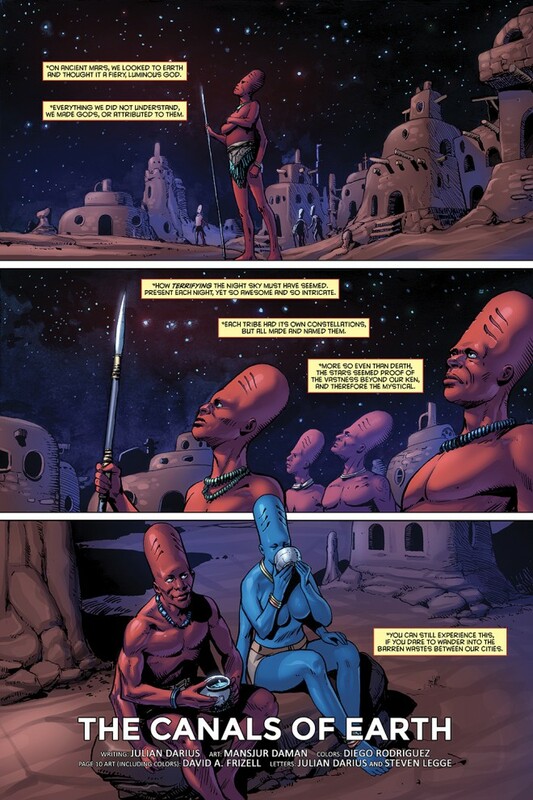 In issue #3, there's a story in which early Martians visit Earth and hunt humans, whom they see as animals. It's another instance of exploring this idea of the Other. We're the animals there, but we kind of identify with the Martians because they're the protagonists. Isn't this what we've done to every other animal species on the planet, including ones I regard as intelligent? Heck, we've more often treated other humans in this way than not. By the present, in the series, we know that Martians are concerned with enlightening us, nudging humans towards a more developed mentality. But it wasn't always the case. And in terms of what might really happen, I think we like to think that extraterrestrials (from wherever) would be interested in enlightening us and sharing this wonderful interplanetary communion. The argument there would be that a civilization capable of interplanetary travel would have evolved to this more enlightened mode of thought. But I'm not sure that follows. I think if you look at human history, we've certainly rarely shown this level of enlightenment towards each other or to animals. Evolution doesn't demand merciless advantage, but neither is it a clear case of respecting species we tend to see as inferior. There's certainly a good argument that we shouldn't be trying to contact extraterrestrial life, because it might be inviting disaster. Having said that, I'm very sympathetic to the idea that we simply wouldn't recognize or be able to communicate with extraterrestrial life. There's some evidence that life tends to evolve along certain paths, but there's no reason to think bipeds are the rule, nor that individualism would be as important to another species as to us. If you think about other species on Earth, they physically see differently, and they have different social structures. Their metaphors would be totally different. If we project this onto an interplanetary species, it might not even understand us, or have an interest in doing so. I'm also very sympathetic to the idea that what we're most likely to contact are actually the probes -- or technological devices sent out to explore, rather than sending Martians or humans everywhere. The older I get, and the more I continue thinking about the future of space travel, the more I get to this point. We're just not evolved to do well in space. We can compensate, but it's expensive, and the vast distances involved present basic challenges. It's a lot easier to send artificial intelligences out, perhaps with genetic material to create colonies with. These artificial intelligences and probes might be biological -- engineered species. But I increasingly suspect that, if we do encounter extraterrestrial life, it'll be indirect in this sort of manner. Me: What can you tell us about the next issue, Martian Comics #6? Julian Darius: Martian Comics features both a continuing story, titled "The Girl from Mars," and various other Martian stories. Martian Comics #5 is a full-length Martian story, which is why it's self-contained. You don't need to know anything about the series to enjoy it. 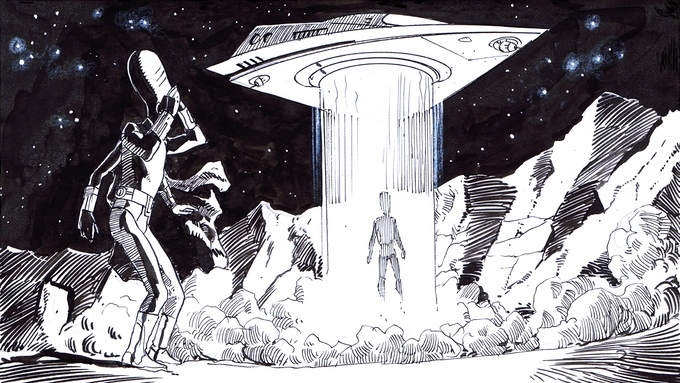 With Martian Comics #6, we return to "The Girl from Mars." And at this point in that story, the villain is narrating what he's been up to on Earth. Issue #4 covered 1945-1961. And issue #6 covers the Kennedy administration. The cover of Martian Comics #6 references the poster for Oliver Stone's JFK. (I like homages to works outside of comics, rather than yet more homage to superhero comics covers. This also reflects the sensibilities of the series.) So we'll be exploring this alternate history and its version of the Kennedy assassination. As the series continues, we're going to keep moving forward through history. It's a story within a story, in which we explore the secret history of the world in detail, from World War II to the present. There are a lot of wheels in motion in the comic! But it'll all make sense, and you can hopefully pick up any issue or story and appreciate it, on its own terms. Me: Thank you for your time and wonderfully detailed responses Julian! If you’re interested in learning more about this project, check out the official webpage for Martian Comics. Also, if you sign up for the Martian Lit mailing list, you’ll receive a free PDF book. And don't forget to pledge money to their Kickstarter. Thanks so much, Nicole! I loved your questions, and it was a joy doing this! All my best!